Two Fridays ago, my mother called me urgently in the midst of my early afternoon Shabbat cooking. Come to the hospital quickly she said emotionally, Savta (Hebrew for grandmother) doesn’t look like she is going to make it. My mother arrived in Israel just one day before for a routine visit. Savta (her mother) recently checked into the hospital with a sprained wrist, and my mother planned to help her make the transition to a rehabilitation center for some short-term physical therapy before returning home. I visited Savta at the hospital earlier that week and had one of the liveliest conversations with her in recent memory. Although I knew Savta was in her nineties, this caught me totally off guard. The complete shock that overtook me in that moment was overwhelming. Other than the sprain the doctors said she was fine and was ready to get back to normal life. Hashem apparently had other plans. Within hours of getting the phone call, with tears and broken hearts, we laid my Savta to rest at Har Hamenuchot (cemetery in Jerusalem) less than two hours before Shabbat, in order to honor the dead by not delaying her burial. We all made our way back to Bnei Barak, where my grandfather now lives alone, to spend Shabbat together as a family and be there for each other. So began the shiva. In Jewish custom, after a family member dies, there is a week-long mourning period in which the immediate family (so my grandfather, my mother, and her siblings) sit shiva, which entails sitting on low chairs to symbolize how they are lowered by their grief, not showering or changing clothing, and no music or festivities of any kind. During shiva, close friends, family and neighbors come to pay their respects to the family members. The beautiful thing about shiva is that you get to meet so many different people who knew the deceased in many different contexts and can share so many incredible things about their life that you didn’t know. It’s a great way to channel our emotions towards positive thoughts and memories rather than dwelling in grief. My Savta was an incredible woman. She was strong-willed, intelligent, beautiful and loving. She was born in Komlós, Czechoslovakia which is now in Ukraine and called Khmil’nyk. She had three sister and three brothers and lived a very nice life in her childhood years. When the Nazis invaded, they deported the whole family to Auschwitz along with everyone else in the town. Immediately after disembarking the train at Auschwitz, before the women and men were separated and before anyone knew what was really going on, my Savta’s father must have had some feeling, as he donned his Talit (prayer shawl), put the two boxes of his Tefilin in each pocket of his jacket, and blessed every one of his children. My Savta never saw her parents or two of her brothers again. Later, Savta learned that they had been killed immediately. The Nazis sent my Savta and her sisters to the concentration camp at Birkenau where they stayed together throughout the war until they were liberated. After the war, they were brought to a Displaced Persons camp in Italy, where my Savta met a young survivor from Romania. They soon married and immigrated to Israel illegally, and after a short time at a kibbutz the British discovered this and deported them to a camp in Cyprus. Shortly thereafter, my Savta gave birth to my uncle, my mother’s older brother. At the time, the Queen issued special quota allowing 500 newborns to be sent to Israel. 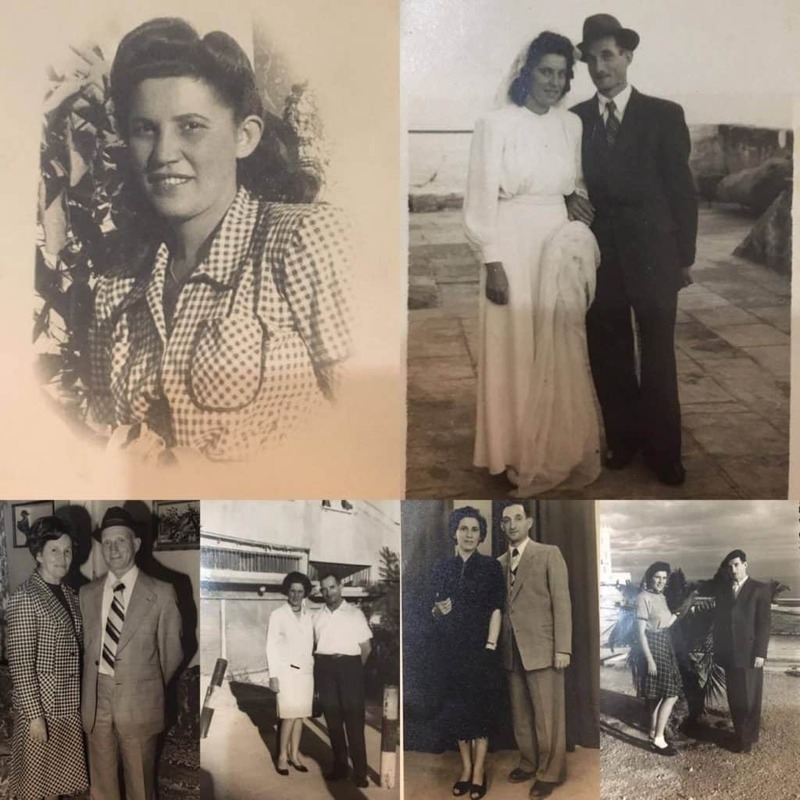 My grandparents were one of the lucky beneficiaries of that new legislature and they were finally able to make their new home in Israel in 1947. My grandfather was then drafted into the army and fought in the Independence War in the canon unit while my grandmother was home with my uncle. They had 3 more kids (including my mother) and continued to make a beautiful life for themselves. My mother grew up in Lod, a city not far from where I live now, and in 1962 they moved to Bnei Barak and have lived there ever since. During the week of shiva we heard some new tidbits about my Savta. She made etrog jelly every year after Sukkot. People who were in their third trimester of pregnancy would come from all over to have some, because it’s a segulah for a quick and easy labor (in Judaism, a segulah is a symbolic action intended to create good fortune). Another interesting story was how my Savta was voted the Beauty Queen of her DP camp in Italy. Perhaps the most shocking discovery of all was when some relatives came to visit and brought with them birth records of Savta’s entire family that they recently retrieved from Komlós. We found out that my Savta lived to the ripe old age of 95, not 92 as we originally thought. On a funnier note, I also learned that my grandmother was convinced that I was pregnant and she even told all her friends and neighbors. I found this out when I began to lift a suitcase and everyone immediately said NO! in unison and rushed to my aid. I heard that my Savta kept a Hungarian recipe book and for the next 7 days I tried to find it. Unfortunately, she didn’t need the book in recent years since she knew everything by heart already, so the book wasn’t anywhere obvious. I am still looking for it and I hope as things get sorted it will turn up and I’ll be able to see all the delicious things my Savta had created. She was an amazing cook— my mother and I got it from somewhere! Although I wasn’t able to find the book and discover some new family recipes, my mother did teach me some new recipes she knew from Savta by heart. I decided that Habart Bableves was the perfect recipe to start with and pair with this post. It’s my Savta’s Hungarian creamy yellow bean soup. I’m not sure how accurate the name is (and a few minutes of research online confused me even further) but this is what my Savta called it so that’s what I’m going to stick with. This soup is served chilled, and timing is appropriate since green beans are in season now and the summer heat is upon us. The literal translation of the soup is “Scrambled Bean Soup” since it traditionally got its creaminess from whisking in eggs. My Savta made her soup with rivon (Hebrew for buttermilk) so that’s what I did. She didn’t cook with many seasonings other than salt, pepper, and paprika, so that’s what I did too. I usually adjust recipes to my tastes, but this time I wanted to stay as true as possible. I roasted some radishes on the side because if you come from a Hungarian family like I do (they are from Czechoslovakia, but was culturally Hungarian because it was in the Austro-Hungarian Empire so their foods are Hungarian) you know that we like our chicken soup on Friday night with some fresh salted radishes. I added my own Israeli twist by serving it with fried halloumi cheese, to bring us full circle from when my Savta was in Komlós to her beautiful life in Israel. Savta, may your memory be a blessing to us all. May we all live to be able to lead such extraordinary lives, find happiness from nothingness and always be grateful and appreciative for the simple things. I am so happy that I made Israel my home this year and got to see you often. I am happy you got to see your grandchildren married and give you much nachat (gratification, especially from achievements of one’s children). I love you and miss you so much already. In a large stock pot, place the stock, water, onion, garlic, dill, parsley, and seasoning. Cover, place over a medium flame and bring it to a boil. Lower the flame and simmer for 20-30 minutes. Add in the green beans and cook for an additional 5-15 minutes, depending on how crunchy or tender you want your green beans. Remove the soup from the flame and allow the soup to cool slightly. Temper the buttermilk with a few ladles of the soup, whisking constantly. Transfer the buttermilk to the soup pot, whisking until smooth. 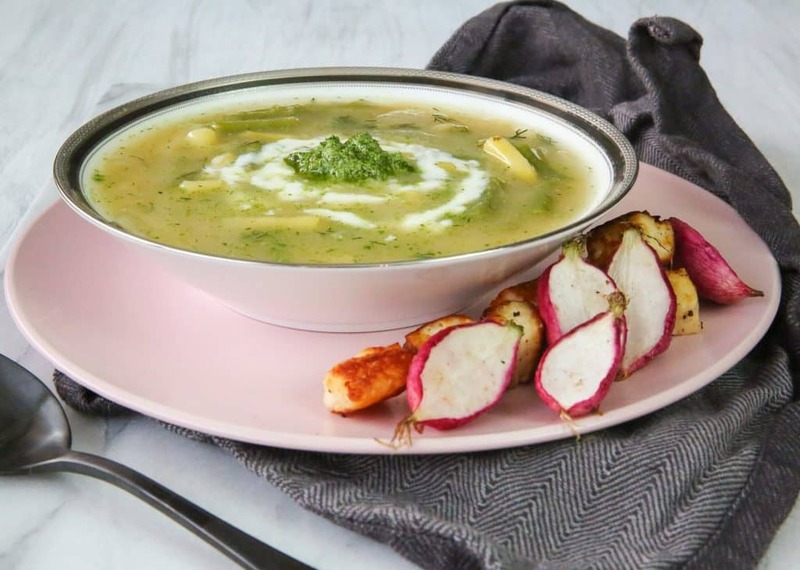 Ladle the soup into a bowl and swirl in some buttermilk and top with a dollop of pesto. Serve the soup hot, warm or chilled. You can use store bought pesto or make your own. I used a combination of parsley, dill and cashews. Halve the radishes and place on a parchment lined baking sheet. Drizzle with olive oil and lots of Himalayan salt. Roast at 400 F for 20 minutes. Serve next to the soup. Drain the halloumi and cube it. Heat up a frying pan over a medium flame and coat it with oil. Add in the halloumi cheese and fry on each side for around 2-3 minutes until golden brown. Serve hot. Yehudit, that is absolutely beautiful!! You wrote a very touching tribute to your Savta. The pictures are perfect – and so is the recipe. In my family it was called “intergeshlugena . . .” (sometimes using corn instead of beans – don’t know how it was spelled in either case). May your wonderful memories be a comfort to you – She was undoubtedly very proud of you. Thank you so much, means a lot! Funny that it’s the same soup with such different names! Thanks for sharing this recipe. 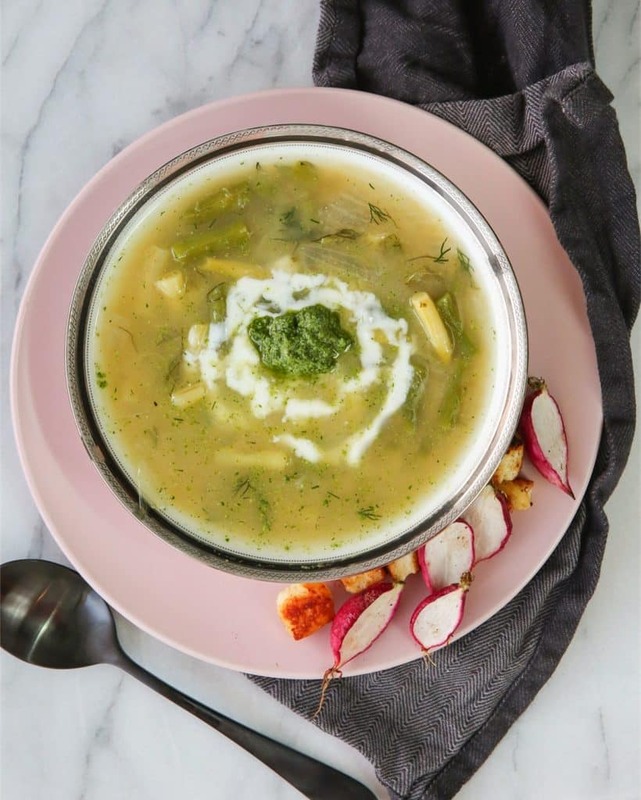 I grew up eating this soup and radishes with chicken soup! Thank you! We have to continue our family traditions! Tears where running down my cheeks ,reading the life story you wrote so beautifully about my mother . The way you wrote it , really touched my heart . I love you emma.